In order for seeds to germinate and develop into healthy plants, you need to pay close attention to their soil, light, water and temperature requirements. These vary slightly from one species to the next. Some seeds are very easy to germinate, while others have more exacting requirements. Always read the information on the seed package for specific germination instructions. Depending on the plant, you'll start most indoor-sown seeds about 6 to 8 weeks before the last frost date and most outdoor, direct-sown seeds around or after this date. There are some exceptions to this rule, so be sure to check the seed packets as soon as you get them to find the best sowing time for your particular seeds. Some plants appreciate a little special pampering and need to be guaranteed a more stable, controlled environment than what they are likely to receive outdoors. Indoor sowing is practically a must for slow-growing annuals and vegetables; otherwise, they might not bloom or produce a usable harvest before frost. More controlled environment: Some seed requires more exacting conditions for germination and early growth than can be provided outdoors where heavy rains and temperature extremes can damage or destroy an entire seed planting. Ease of handling: Small seed is often easier to handle indoors where it will not be blown or splashed by wind and rain; seeds that take a long time to germinate can be more easily monitored without having to compete with weeds. Fewer disease and insect problems: Seedlings started indoors in sterilized potting mixes are less likely to be affected by disease or insects. Head start: By starting seed indoors before conditions are suitable for sowing outside, you get several weeks' head start on your garden. Lengthen your growing season: Some vegetables and flowers would not have time to mature in regions of the country with short growing seasons, so starting plants indoors allows you to grow a wider range of crops. Double cropping: You can sow seed indoors for a second crop before your first crop is harvested from the garden. For example cabbage and broccoli seed can be sown indoors (or in an outdoor seed bed) for transplanting into the garden for fall, replacing summer crops of beans and squash. CONTAINERS: Traditional containers include wooden or plastic trays (often called flats), multipart plastic containers (called cell packs), peat pots and pellets, and soil blocks made from a soil-block mold. Garden centers often sell special seed-starting containers that are especially good for keeping the soil and seedlings from drying out. Some of the best containers are made from disposable materials readily found around the house - for example, milk cartons, plastic jugs, aluminum pans, and plastic trays. GROWING MEDIUM: Use a light-weight mix containing peat moss, perlite and vermiculite. Some mixes contain both slow-release and fast-release fertilizers. 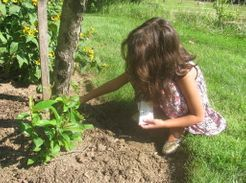 No additional fertilizer is necessary until the seedlings are transplanted to the garden. HEATING CABLES, TAPES OR PADS: These insulated, waterproof cables, tapes or pads are thermostatically controlled to help speed germination of seeds by providing and ideal 70 degrees Fahrenheit soil temperature. LABELS AND MARKING PEN: Many plants are difficult to distinguish in their seedling stage, so label each variety carefully. MISTING BOTTLE: This is a good way to apply a gentle spray of water to keep seedlings moist without dislodging them. ARTIFICIAL LIGHT: Ordinary fluorescent lights produce little heat. Seedlings can be set very close to the lights (4 to 6 inches away) so they receive as much light intensity as possible. 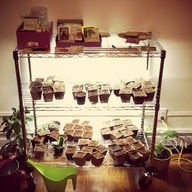 As the seedlings grow, adjust your lights to maintain the proper distance. Set a timer so your seedlings receive light for 12 to 18 hours a day. FERTILIZER: If your gowing mix contains no nutrients, fertilize your seedlings after 3 or 4 weeks of growth with a weak solution of balanced fertilizer following the manufacturer's directions. Seedlings generally need no supplementary feeding if your planting mix contains fertilizer. Apply a diluted liquid fertilizer solution when you transplant them into the garden. When the seedlings have developed at least 2 true leaves, thin them or transplant them to a larger growing container. Crowded seedlings will result in weak spindly plants. Indoor-grown seedlings need to be toughened up before they are transplanted to the garden by placing them in a cold frame, or by taking them outdoors to a partially protected location for an extended time each day for about a week. This will reduce the shock of transplanting. Whatever containers you use, planting tiny seeds with any precision is almost impossible. But here are two tricks which might make the process a littler simpler. Try mixing the seeds with a few tablespoons of clean sand and then spread the mixture as evenly as you can over the soil surface. Or you can place the mixture into a salt shaker and tap out the contents onto the soil. You can try a fine tweezer, but that generally works best with slightly larger seeds. Smooth the surface of your prepared planting area with a rake. Use a hoe to make furrows. Plant the seed at the depth suggested on the seed package. If you ae planting in rows, follow the instructions for the recommended spacing between rows. For straight rows, use a string guide tied to a stake at either end of the row. For planting a wide row or block of a single flower or vegetable, pull back the soil to the appropriate depth and broadcast the seed thinly over the soil surface. Always plant twice as many seeds as you need plants, since some seeds may not germinate, some may be eaten by animals, and some may get washed away by heavy rains. You can always thin plants later if they get too crowded. Cover the seed as directed on the seed package. Label the planting area with the name of the seed and the planting date. Gently water the area using a watering can or hose with a fine-mist nozzle, and keep the surface moist until the seedlings are well estabished. When the seedlings are a few inches high, thin them to the spacing suggested on the seed packet. Seed tapes consist of seed embedded in paper tape at the proper spacing. They are a convenient way to plant vegetable and flower seeds at the proper spacing, reducing the need for thinning or transplanting. The tapes can be set to form either straight or curved rows, and they can be cut to the length you desire. The paper disintegrates after planting. Especially in hot weather, when crusting of the soil surface can seriously inhibit germination, spread a layer of vermiculite over the seed and keep it evenly moist. This will prevent a soil crust from forming, and will also protect seeds from washing away during heavy rains. To speed germination and to protect seedlings, cover seedbeds with a garden blanket or floating row cover. The blanket will allow light and water to pass through it but prevent birds and insects from destroying your planting. Keep the seedlings moist, but do not overwater. Sow the seed as evenly as possible, and thin out the seedlings when they begin to crowd each other. Use a sterile soilless growing medium with good drainage. Never use garden soil dug from your yard. Thoroughly wash all seed flats in soapy water and rinse them in a bleach solution, or use a fungicide (follow package directions) to drench the growing medium before sowing. After sowing, mist the seeds with a soluble fungicide. Seedlings that have long, spindly stems with large spaces between the leaves are the result of one or more of the following conditions: low light levels, not enough hours of light per day, excessively high temperatures, and overcrowding. Thin out the seedlings if necessary, move them to a slightly cooler spot, and give them more light. Off-color plants may have a nutrient deficiency problem. If the leaves are turning a pale yellow, it usually indicates a nitrogen deficiency. If they are bronzy or brown around the edges, there is probably a potassium deficiency. A plant is most likely deficient in phosphorus when the undersides of the leaves are a reddish purple color. To avoid nutrient deficiencies, give the seedlings a weekly feeding of a complete liquid fertilizer with trace minerals. For seedlings, use only half the recommended amount as indicated on the label. Do not overfertilize, or damping-off may occur. Mold on the surface of the soil indicates one or more of the following problems: excessive fertilization, overwatering, poor drainage, and poor air circulation. Scrape the mold off the surface, then cut back on fertilizing and watering. Choose a growing medium with better drainage next time. Use a small fan to improve air circulation around the seedlings. 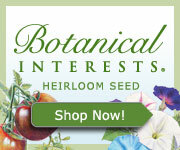 Mastergardening.com has a complete line of seeds to get your garden started this spring.